CoolTek garments -- cooling effect lasts up to eight hours. COOLTEK Australia has launched a range of heat-evaporating garments able to reduce body core temperature and the effects of heat stress, to provide long-lasting comfort, safety and increased productivity. A reduction in heat stress can lessen worker fatigue, and tests conducted in the USA indicate workers wearing a CoolTek vest showed a 40 per cent increase in productivity. 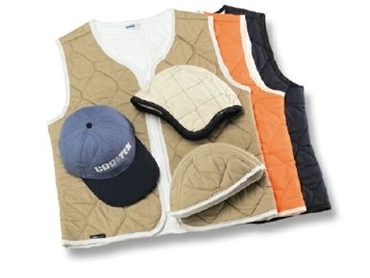 CoolTek's unique cooling effect can last up to eight hours (when used as an outer garment) or when used as an under garment, up to four hours. When immersed in cold water for three to five minutes, the new hydroweave fabric technology allows the clothing to retain its coolness, using water vapours to cool the body without allowing any water to pass through the clothing. CoolTek garments include three quilted layers: an outer shell of cotton fabric, an inner core of polyester fiberfill (embedded with water absorbing polymer) and an inner liner fabric made with a breathable film, laminated to cotton or high density nylon. CoolTek is also available with a flame protection coating (Nomex) to make the garment fire resistant. The CoolTek Heat Relief range of products includes coveralls, bodysuits, vests, blankets, headbands, neckbands, hard-hat liners, skullcaps and wristbands.